With Gael Clichy becoming a forgotten tale at Arsenal after departing for the petro-greens of Manchester City, the media Vultures started linking Leighton Baines and Liverpool’s Jose Enrique to the club but Wenger surprised everyone by saying that Kieran Gibbs was going to be his first choice left back for the 2011/12 season. Gibbs played only one game at the start of the season before doing what he was already renowned for, getting himself injured. Wenger played Sagna out of position for a couple of games but an illness paved the way for Armand Traore in Old Trafford and the Senegalese was largely disappointing. The 8-2 mauling at Old Trafford was an eye opener for Wenger and he knew that he had to make some major changes in the squad or else he was toast for the rest of the campaign. Armand Traore put an end to his disappointing Arsenal career when he made a switch to Queens Park Rangers and it was evident that Arsenal needed a new left back so Wenger turned to the experienced Andre Santos from Fenerbahce. At that point, the lad had already notched up 22 caps for Brazil and had contributed to winning the 2009 Confederations Cup with his nation two years ago. Andre Santos is a full back that’s also adept playing as a left winger and like every average Brazilian with the exception of Denilson and Lucas Leiva, he’s very skillful and he has a good technique. He’s also a decent free kick taker and he has a flamboyant style of play. Just like the Brazilian legendary left back Roberto Carlos, Andre Santos can unleash a surface-to-goal torpedo from his left boot and he can also place the ball when he’s close enough to goal; at least, Petr Cech can attest to that. His major flaw as a player is his overzealous attacking nature and he’s not that fast enough to track back should a counter attack surface. He also tends to be selfish at times because he loves dwelling on the ball. When he arrived with Mikel Arteta, Per Mertesacker, Yossi Benayoun and Park Ju-Young, Arsenal fans were elated at the swift nature of their transfers and they were eager to see what the players had to offer. Andre Santos loved bombing forward and he opened his Arsenal goalscoring account against Olympiakos. In the enthralling van Persie-inspired victory over Chelsea, Andre Santos received a through ball from Alex Song before placing his shot past a hapless Petr Cech in goal. In a dead-rubber game against Olympiakos in December, Andre Santos suffered an ankle injury that sidelined him for close to three months. This was the period when Arsenal had no recognized fullbacks with Kieran Gibbs suffering from hernia, Carl Jenkinson having a back problem and Bacary Sagna fracturing his leg in White Hart Lane. He had to wait till the end of the season to score his third goal for Arsenal – a vital equalizer against West Brom in the last game of the season. 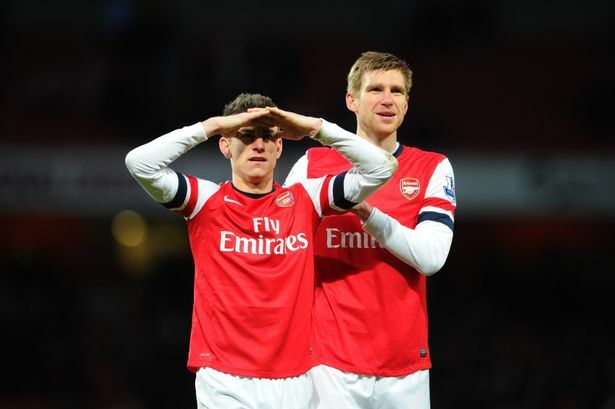 In summary, the 2011/12 campaign was a decent campaign for the Brazilian and with Gibbs finally getting over his injury woes, Arsenal fans had hoped that the two left backs would battle fiercely for the shir in the 2012/13 season. Little did we know that Andre Santos was going to change for the worst. Kieran Gibbs return to full fitness as well as consistent game time saw the player become reborn and he became a bright spark in Arsenal’s 2012/13 campaign. More games for Gibbs ultimately meant that Andre Santos was going to spend more time in the dugout but when the Brazilian was summoned into the pitch, he became a Chamakh 2.0. Things weren’t that good for the Brazilian off the pitch as he was arrested in September 14, 2012 for practicing Grand Theft Auto in reality. The police chums had stated that the left back was speeding at 130 mph with his Maserati. He was charged with dangerous driving and appeared in Hendon Magistrates’ Court on September 27. It was believed that Andre Santos was going to face a two-year jail term if he was convicted but thankfully, he wasn’t. When he returned back to the pitch following another trademark Gibbs’ injury, he was badly exposed in Arsenal’s shameful group stage defeat to Schalke 04 and the more Andre Santos played, the higher the risk of Arsenal conceding a goal with a cross from the right hand side, as if the team’s defensive problems weren’t enough already. While his cup was getting full with the fans, he reached his breaking point when he exchanged jerseys with Robin van Persie at halftime, despite putting up a torrid display all game long. 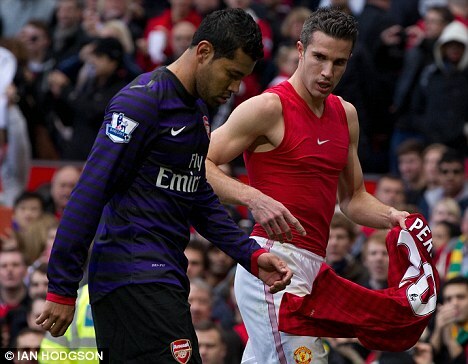 Andre Santos couldn’t even wait for van Persie to enter the tunnel before requesting for his jersey, as that was his problem at that point, rather than reflecting on a poor first half he had. While Arsene Wenger kept calm, fans voiced their disgust on that act and many Gooners put the all-smiley, cuddly maverick on their bad books. To add to his stinkers against Schalke and Manchester United, Andre Santos put up another appalling outing against Brighton in the FA Cup. Despite the pleas from the fans for the club to get a striker and a holding midfielder in the January transfer window, Arsenal acted faster than Usain Bolt on transfer deadline day when Kieran Gibbs picked up an injury against Liverpool. Andre Santos replaced Gibbs on the night and put up another horror as he casually allowed Jordan Henderson to skip past him with consummate ease before a stroke of luck allowed the young Englishman to score the visitors second goal. With Thomas Vermaelen’s fitness being an issue, the chances of featuring him as a left back for a considerable chunk of the season weren’t in Wenger’s lexicon. So the club swooped for Nacho Monreal that has slotted in superbly into the defensive line, like he has been there for ages. With Monreal and Gibbs clearly above Andre Santos in the pecking order, he was living on borrowed time and was heavily linked with a move to Turkey but Arsenal has decided to offload the Brazilian to Gremi for the remainder of the 2012/13 season. In his touching goodbye message to the club and the fans, Andre Santos thanked everyone for their support and hopes to come back soon. For the good of everyone concerned with Arsenal, the fans hoped that Gremio would sign him on a permanent basis. Unfortunately, Gremio didn’t have the financial capability of sealing a permanent move for the Brazilian, so he returned back to the club and even voiced his disgust of coming back to a place where he clearly wasn’t wanted. Arsenal went to the Far East for the Asia Tour but Andre Santos was left in London and he harbored hopes of finding a new suitor in need of his services. With no club showing serious interest in the shambolic Brazilian, he went the way of his compatriot, Denilson, and after a mutual agreement with Arsenal, his contract was terminated. Flamengo swooped for the Brazilian that was now a free agent, and offered him a two-year deal for him to get his career back on track. Kudos to the Brazilian for realizing the importance of opting to leave and play football, rather than staying at Arsenal to see out his contract while stagnating as a footballer. I’ll always remember Andre Santos for his cuddly smile, hilarious tweets and other off the pitch shenanigans, but on it, he was one hell of a liability and Arsenal paid dearly on several occasions as well. I wish Andre Santos all the best in his time with Flamengo, but from the depth of my heart, he will not be missed.